The classic dancing bears are featured in trippy psychedelic mandala design. 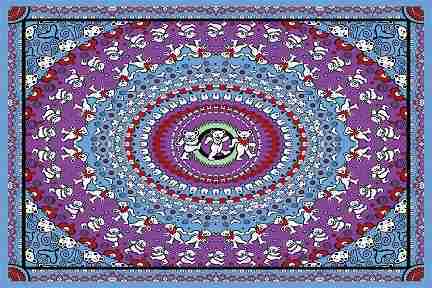 This Grateful Dead tapestry is part of our new mini size tapestries for when space is more limited. They are perfectly sized at 30" x 45", and would look great on any dorm room or apartment wall. This tapestry is a 100% cotton tapestry and it is equipped with specially-designed loops to accommodate easy support from a wall, window frame, ceiling. Officially licensed Grateful Dead merchandise.